Local Enterprise Offices (LEOs) in local authorities from all over the country have joined forces to make an unprecedented investment in raising the profile of the country’s finest food producers. They have linked with The Irish Quality Food and Drink Awards to create a brand new ‘Meet the Buyer’ event, the first of its kind, which will take place on the 23 May from 10.30–5 pm on ‘The Street’ exhibition area at Limerick Institute of Technology (LIT). During ‘Meet the Buyer’ event, as many as 90 food producers will have the chance to pitch their businesses to the top buyers from Ireland, Northern Ireland and the UK who are expected to attend. The event is trade only, so it is open only to buyers from across the food industry such as supermarket groups, food wholesalers, retailers, independent fine food shops, foodservice, development chefs, restaurant chefs and more. Buyers will be able to sample a huge range of the finest Irish produce and also meet the passionate, talented producers behind it. In advance of the event, all of the participating producers will receive training from their Local Enterprise Office on how to maximise their attendance; looking at the importance of branding, stand layout, literature and how their product is best presented and sampled. There will also be break-out sessions during the day, hosted by the buyers, focusing on the different purchasing strategies employed by the multiples, the products that they are looking to stock in the future, as well as major issues facing the food industry today such as packaging. Attendees at this event will also have to opportunity for free entry into this year’s Irish Quality Food Awards 2019. “As businesses prepare for the impact of Brexit and any new trade agreements that follow, this is set to become one of the most important events of the year for new food producers in Ireland,” he added. The Local Enterprise Offices are funded by the Government of Ireland through Enterprise Ireland in partnership with the Local Authorities. 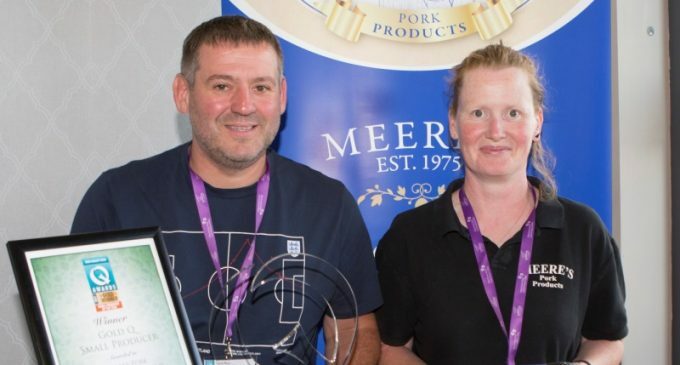 Orlaigh Meere and Barry Rees of Meere Pork Products who attended last year’s local producer’s showcase.